The conserved two-domain ribosomal protein (r-protein) L1 is a structural part of the L1 stalk of the large ribosomal subunit and regulates the translation of the operon that comprises its own gene. The regulatory properties of the bacterial r-protein L1 have only been studied in detail for Escherichia coli; however, there were no such studies for other bacteria, in particular, Thermus thermophilus and Thermotoga maritima, which are more evolutionarily ancient. It is known that domain I of the r-protein L1 might have regulatory properties of the whole protein. The aim of this study was to identify regulatory sites on the mRNA of T. thermophilus and T. maritima that interact with r-proteins L1, as well as with their domains I from the same organisms. An analysis of the mRNA of the L11 operon T. thermophilus showed the presence of one potential binding site of the L1 r-protein, two such regions were found also in the mRNA sequence of the L11 operon of T. maritima. The dissociation constants for the L1 proteins from T. thermophilus and T. maritima and their domains I with mRNA fragments from the same organisms that contain the supposed L1-binding sites were determined by surface plasmon resonance. It has been shown that the ribosomal proteins L1 as their domains I bind specific fragments of mRNA from the same organisms that may suggest regulatory activity of the L1 protein in the T. thermophilus and T. maritima and conservatism of the principles of L1-RNA interactions. Original Russian Text © A.O. Mikhaylina, O.S. Kostareva, E.Y. Nikonova, M.B. Garber, S.V. 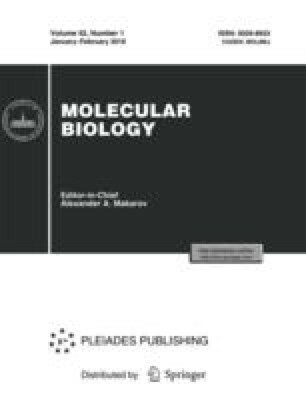 Tishchenko, 2018, published in Molekulyarnaya Biologiya, 2018, Vol. 52, No. 1, pp. 98–105.